Tain Golf Break. Tain Golf Course - Overlooking the Dornoch Firth, Tain arguably offers one of the best settings imaginable in the Highlands for a round of golf. With the sea on one side and the backdrop of the mountains behind, every day brings a different aspect to this challenging and beautiful course. Designed by Tom Morris, the layout of holes guarantees an interesting round for beginners or experts. 18 holes. Par 71. 6,404 yds. 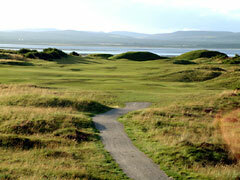 Links Course. Golf Tain.